One of the things I LOVE best about childhood is the ability kids have for embracing individuality and having fun. The Youngest Diva gravitates towards bright colors, sparkles, jewels, ruffles, etc. She can put together an outfit that would make your eyes hurt and not only pull it off but bring it to life with her confidence. I truly love this about her and I hope it is something that she carries with her forever. Christie from Childhood 101 is one of those mama's that not only embraces that spirit of childhood but celebrates it. 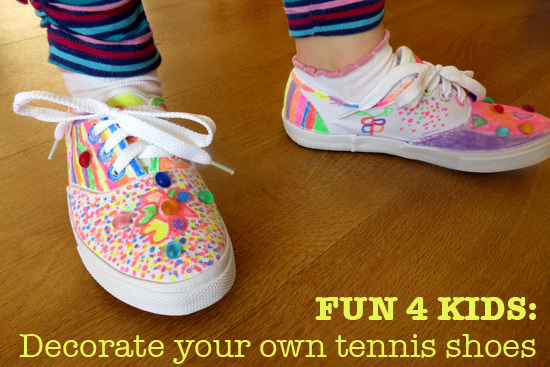 Today, she is here to share a fun DIY Craft for Kids - Decorating Your Own Tennis Shoes. This is the kind of activity that I know the Youngest Diva would be really excited about. My five year old daughter has been eying a pair of brightly coloured sneakers at a local shoe store for a while now. Unfortunately, each time we have inquired, her size has been unavailable. 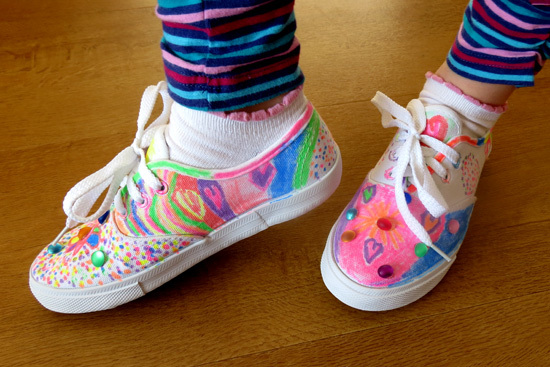 To say she was excited when I suggested she could design and decorate her very own pair would be an understatement! This project was a lot of fun and took a number of sessions over the course of about a week to complete. Now that they're done, I can't get her to take them off! 1. 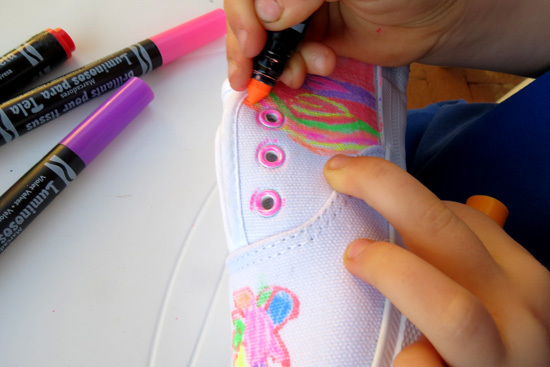 Remove the shoe laces and adorn the shoes with your very own designs using the fabric markers. 2. Follow the manufacturer's directions to heat set the design. Our markers required putting the shoes in the tumble dryer for 30 minutes. 3. Glue jewels into place with hot glue. 4. Re-thread the shoe laces and you are good to go! 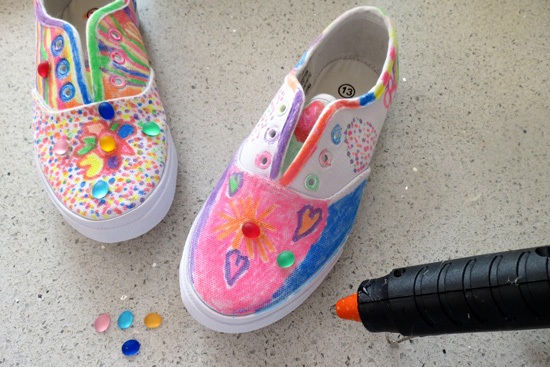 Do you know a young person who would enjoy designing and decorating their very own sneakers? Christie Burnett is a qualified early childhood teacher and mum of two very busy, little girls who shares her parenting adventures and passion for play and early childhood education on her award winning blog, childhood101.com. Her first book Time to Create: Hands-On Explorations in Process Art for Young Children is now available internationally through all major online booksellers, including The Book Depository, Amazon and Fishpond. Faigie, You definitely have to know if this is an activity your child would enjoy and is ready for. Like any activity, they aren't all for every child. I don't think that it's so much an age thing as an individual thing. I agree with Amie who commented that this type of activity is a wonderful way to enjoy process art. You could even help the child figure out a way to turn any "mistakes" they feel happened into something else if it's really a big problem for them. I do that even with paper art with my girls and they've gotten good at thinking creatively when things don't go as planned with their art work. I wouldn't rule this out just because a child was on the younger side. They would be so proud to wear their artwork and it can be a great learning experience. I love the idea of helping them turn a mistake into something even better!! I agree that it could be a great learning opportunity for talking about mistakes and how to work through them in art. 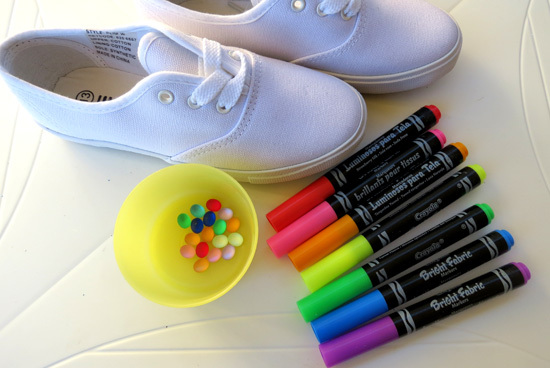 If a child isn't ready for that yet, you might try washable markers on the shoes. You couldn't immediately start over, but you wouldn't have a "ruined" piece of art either. What a fabulous project!! My daughter would go crazy for this! Have you read the book Beautiful Oops before? Perfect way to help children learn how to turn 'mistakes' into something positive with a creative spin on it too! It took my son ai ireally long time not to need everything to be perfect, and to have a "right" way of doing it - the only way he got out of that is lots of practise, and open ended activities iwithout a "right or wrong" answer - I think this is a great activity for childiren of any age - my three haive alil fabric painted t shirts, and the youngest is one! My girls would love doing this...It will be our back to school activity next month and how fun to wear them on the first day of school! This looks like so much fun. We're going to try it this week. I can just imagine R's shoes will be covered with Star Wars starships! Thanks for the idea. We've given white shoes and fabric markers as gifts and it has always been a hit! Even my smallest kid LOVED using fabric markers on a t-shirt so I think this is fun for everyone! What a fabulous gift idea, Kate, I love it. She's done a fantastic job of them, Christie! You can see the time and effort she put into her design. We've given our tennis shoes this treatment too! We added heaps of silver diamontes for ultimate bling! They're so cool! What a wonderful activity and canvas for art. I can really see children's confidence being boosted by wearing their own art. I LOVE this activity! Why not let them have fun and enjoy childhood as much as you can! My girls love to wear their shirts they have made! What a fun post! This was one of my favorite activities as a kid and I can't wait to do it with my own kiddos! So excited to see this idea. I think it's absolutely brilliant. I'm off tomorrow to get the shoes. Our little ones are not big enough yet (two and a half), but I am pinning this so that when they are older, they can do it. Great idea! This is a wonderful idea! Imagine doing it over the years? What a "timeline"
My kids would love to do this. So fun.